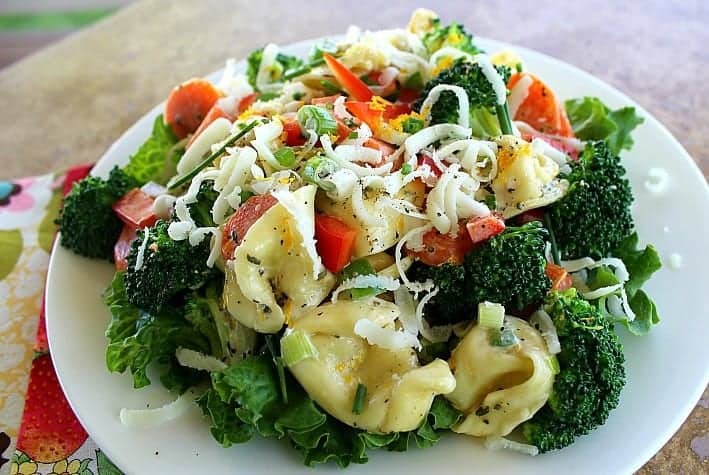 Cheesy tortellini pasta and crunchy-fresh vegetables are the perfect pairing in this Tortellini Primavera Salad. Broccoli, carrots and bell peppers are fresh-crisp, while green onions provide a bite and baby peas provide a sweet pop. The dressing is just right, starting with good quality mayonnaise, basil and thyme to add lemon and peppery notes. The orange peel gives it the right amount of citrus zing to wake up all the flavors and make the salad unique and super fresh. This recipe for Tortellini Primavera Salad is only one reason for today’s post. I want to talk to you about being a foodie and what it’s like when you meet someone else who shares your love for all things culinary. Webster describes a foodie as “a person having an avid interest in the latest food fads”, and Wikipedia says “A foodie is a person with an ardent interest in food; who seeks new food experiences as a hobby rather than simply eating out of convenience or hunger.” If you felt a sense of understanding and even excitement at these spot-on definitions that describe your soul as a true food hobbiest, you’re a foodie. If you think a lot about food and cooking, you’re a foodie. If you talk a lot about the perfect but unusual flavor that a certain ingredient gave to your newest recipe, you’re a foodie. If your idea of sitting down with a good book means reading through a new cookbook that you just checked out from the library, you’re a foodie. If this sounds a bit extreme and obsessive to you, you are not a foodie…yet. 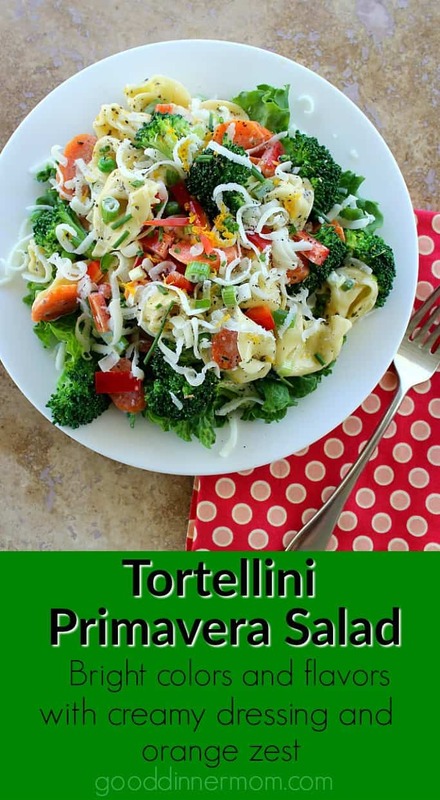 Tortellini Primavera Salad is one of the first recipes I received from Amanda, my foodie soul sister. I remember the first time we met at a neighborhood luncheon shortly after she’d moved into the area. Everyone was chatting and I’m sure we were all thinking that she seemed like a very nice person, blah, blah blah. Then she tells the group “Well, I’m a Foodie”… This person instantly looked different to me, more familiar, like kin. A new but forever friend. Yep. True. For us foodies, there is something so instantaneous about meeting that person who shares an “ardent” love for the culinary art. You feel instantly comfortable and close, and you know that fellow foodie is really going to “get me”. Several years later and an out-of-state-move for one of us (I’m just now forgiving her husband for the uproot), Amanda and I are still friends for many reasons. But when it comes to food, we can talk about new recipes, old recipes, newly discovered techniques as well as recipe disasters for hours without a break. Sharing recipes with foodie fanatics and “normal” friends alike creates a special bond where that experience and the person who shared the recipe will never be forgotten. Every time I make this delicious salad, I’m whisked back in time to Amanda’s kitchen after she made the recipe for the first time, asking me to dissect the ingredients with her to see if the dressing had too much of this or needed more of that, etc. I won’t labor anymore about the foodie-lifestyle because you probably just want to make the darn salad already! And if you’re already a foodie, no further discussion is needed anyway.This recipe has changed a bit since my first tasting. I’ve added a few new ingredients and increased the amount of dressing, which is why I tell you to add half, taste, then add more as desired (pictured is before adding more dressing, and I did end up adding all of it). I’ve also made it several times adding chicken and if you want this to be vegan, it’s easily adaptable for that option as well. If you’re looking for something easy and fresh to share with family or friends, this is a delicious, unique pasta salad side or main dish. And if you’re looking for a conversation piece with your best foodie-hobbiest friend, well you don’t need this recipe for that, because every single recipe is fair game. Right? Here is my foodie friend and me borrowing ingredients one last time before she moved away. 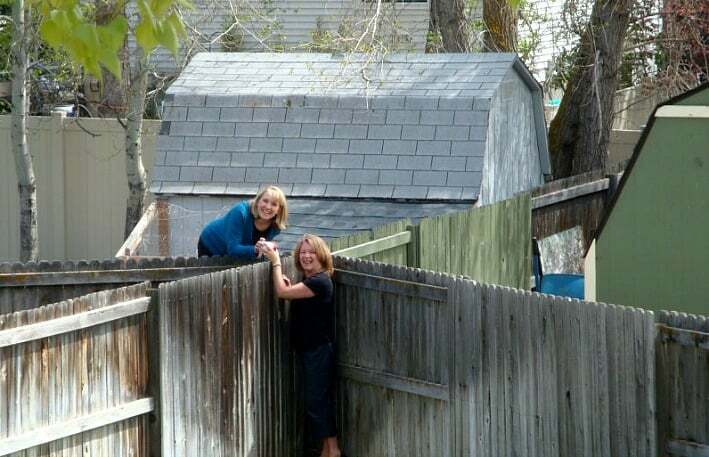 We had a pact that if either of us was missing an ingredient, we could call the other and just say “I’ll meet you at the fence!” I hope all of you find this kind of lifelong friend, whatever your passion. If you don’t consider yourself a foodie, I hope to recruit you someday. Just keep making those recipes and start talking about them. Julia Child said, “Find something you’re passionate about and keep tremendously interested in it.” She knew what she was talking about and she was the ultimate foodie. Good advice no matter what your passion. Final recipe note: Many of you are going to try to switch out mayonnaise with Greek yogurt or olive oil, thinking that mayo is not healthy. If you look for a good quality mayonnaise with a low ingredient list and nothing processed, mayonnaise can be a healthy condiment. Better yet, make your own homemade mayo. It’s quick, easy, fresh and tasty. This is a good one at Wellness Mama. 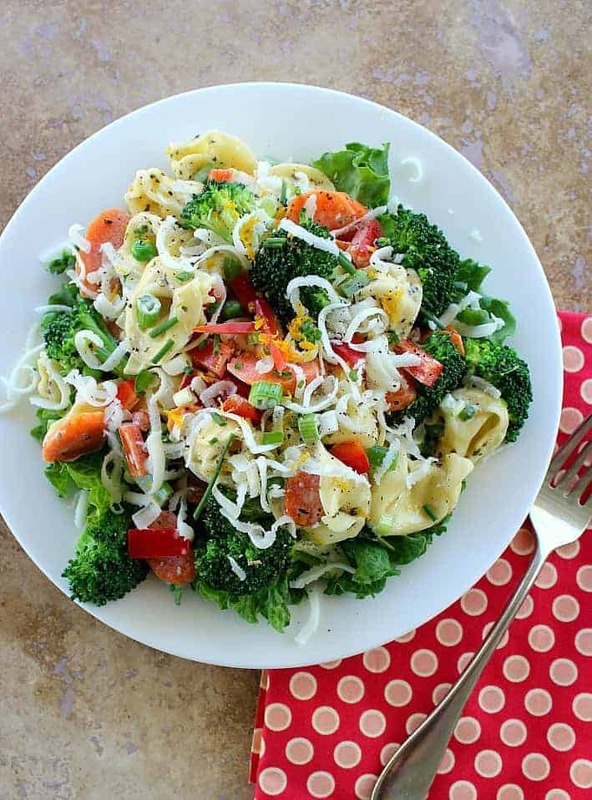 This Tortellini salad blends a bright creamy sauce with fresh and colorful vegetables. Delicious as a side, meatless main dish or add cooked chicken breast. Cook tortellini according to package directions. Drain well. Steam broccoli florets and sliced carrots just until tender-crisp. Cool under running water. 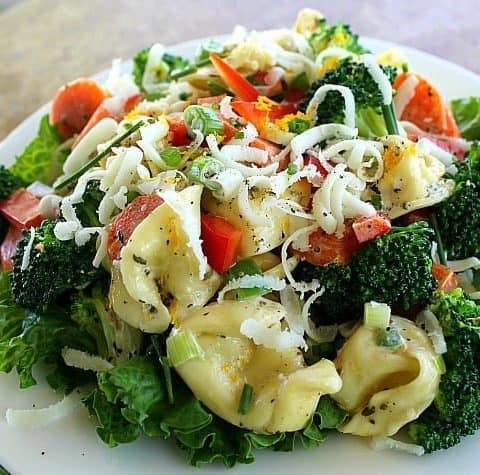 Combine tortellini, broccoli, carrots, green onions, bell peppers and jalapeno in a medium bowl. Place in refrigerator while making the dressing. In a small bowl, whisk together mayonnaise, orange peel, basil, thyme, salt and pepper. Add about 1/2 of the dressing to the salad ingredients and then taste. Add more as desired (3/4 cup seems perfect for us. If adding chicken, use all the dressing). Cook's Note: You can serve the salad immediately if you must, however, the flavors are bolder if allowed to incorporate in the refrigerator for at least 4 hours before serving. Spoon individual portions of salad on plate and top each portion with shredded mozzarella, or add all the mozzarella into large bowl of the salad, toss and serve family style. Adapted from a recipe given to me by my Foodie Soul Sister, Amanda Smith. this looks so fresh and delicious, and the orange peel is genius! I feel like I should give a shout-out to Amanda too…lovely story of friendship ladies! Thanks so much Lee-Ann! First of all, the salad really is delicious and the orange peel is kind of what makes it. I’ll pass on your shout out to Amanda, she is such an amazing friend. I really appreciate you stopping by. Have a great week! Oh my goodness YOU are my foodie soul sister! This looks fabulous with your updates, I will need to make it for my upcoming family reunion! Yum, yum, yum!